"I can smile at the old days; I was beautiful then. I can remember what happiness was." Whatever you may think of Andrew Lloyd Webber, there is no denying that his music has dominated the field of musical theater over the last 25 years as has that of no other composer. His music has penetrated nearly every corner of the globe but for one: China. That all changed in 2001, when a concert was produced to give the Chinese people a taste of Western musical theater, in the form of Webber's music. The setting was hardly auspicious; instead of a proper concert hall, the program was presented in the Great Hall of the People, the Chinese Parliament building. A full orchestra, four named soloists and a large cast of singers and dancers make for an excellent sampler of Webber's music both for the Chinese and for the interested Western viewer. Among those featured is Elaine Page, the original Evita, who tackles both that role and Norma Desmond from the more recent hit Sunset Boulevard. Appearing with her are Chinese pop stars Kris Phillips (Fei Xiang) and Sandy Lam. This is a more than capable cast, and they do a fine job with the music, though Lam's slightly Oriental inflection may sound a bit odd to Western ears. Tony Vincent, who appeared in the most recent movie version of Jesus Christ Superstar also makes an appearance here. But the real prize in this performance is the unnamed woman singing the role of Christine Daae in the selections from Phantom of the Opera. Her voice is like crystal: pure, fine and delicate, but doing fine justice to the music. Hers are some tracks I'll be playing repeatedly. In addition, Bronwyn Mulcahy turns in a vigorous and lively rendition of Buenos Aires that is well worth checking into. Given the constraints of the staging, the choreography is appropriate. The Chinese orchestra (with a few Western principals) is clearly a quick study and has rapidly adapted to the Western theater idiom. Macavity from Cats is a perfect example, with wailing brass that emphasizes the sinuous eroticism of the music even more than the dancers do. As is so often the case, Memory is overorchestrated into pure schmaltz, but that's really the only significant misstep I found in this production. Well, that and the fact that the 180-minute running time on the package includes the documentaries and featurettes; the actual running time is a bit under 135 minutes. Image Transfer Review: The anamorphic 1.85:1 picture is generally pretty good for a live performance, with excellent color and good texture present. Detail is generally acceptable. However, there are quite a few rapid pans that result in digital artifacting, and there is a distracting amount of aliasing present. This probably could have been remedied if the disc used a bit rate more generous than the 3 Mbps present here. Audio Transfer Review: The disc sports three audio tracks, including both a DD and DTS 5.1. Both of these are excellent, without hiss, noise or distortion (a little hiss is present on Pie Jesu, a very quiet piece that was apparently boosted a bit for this presentation). The sonic qualities are best exemplified in the excerpts from Phantom of the Opera, most notably the organ, which is very deep and full. The DTS track is a bit louder than the DD; after correcting for this the half-rate DTS is hardly distinguishable from the DD. The Dolby Surround track, however, is far inferior to both, lacking presence and clear directionality, which the 5.1 tracks both excel in. Applause is mostly segregated to the surrounds, and mercifully is not mixed as loud as one often finds in live concert presentations. Extras Review: A nice set of extras is included here. Foremost among these is a 37m:05s documentary on the preparations for the concert and the difficulties in presenting a work in an idiom that is mostly alien. Two accompanying featurettes include cast interview snippets at the Great Wall and discussing the performance, but neither has much substance to them. A 5m:35s promotional piece on the sponsor, Motorola is included, but it's interesting for the inclusion of two Chinese commercials for the company's mobile phones. Finally, there is a gag version of Music of the Night from Phantom rendered by five of the backup singers from the show. It's cute as a closer for the disc. 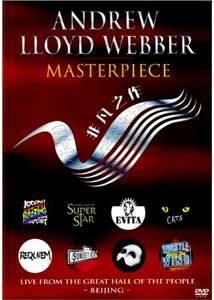 An energetic sampler of the best of Andrew Lloyd Webber, with decent visuals and a knockout set of audio tracks. A few interesting extras make this well worthwhile.